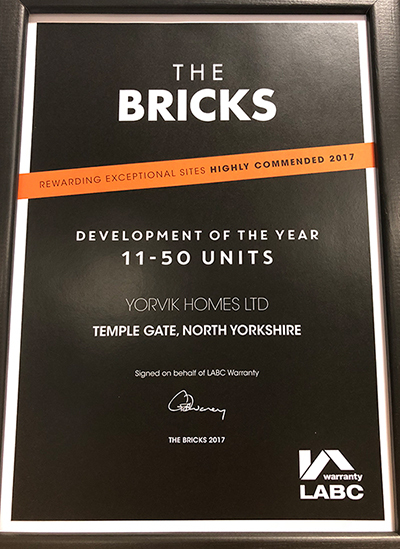 We are delighted that Temple Gate, Richmond received Highly Commended in the ‘Development of the Year’ category at this year’s The Bricks! With over 3000 eligible developments at the start of the nomination process, we were thrilled to have been shortlisted as finalists for The Bricks this year. The event took place in one of London’s iconic buildings, The Shard on Thursday 19th October and was hosted by Britain’s best comedy impressionist, Jon Culshaw. The Bricks has advanced into one of the most exclusive awards ceremonies within the construction industry. The awards are designed to celebrate and recognise companies and individuals within the industry who portray an extra level of quality to their construction or development. Temple Gate, Richmond comprises a collection of 2,3 and 4 bedroom homes situated on the edge of the Yorkshire Dales National Park and within close proximity to the historic market town of Richmond. The development has been specifically tailored to suit its location and environment without compromising attention to detail, superior design and quality. The Yorvik team are proud to have received the award and had a great evening celebrating. Congratulations to all those that were nominated and we hope to see you again next year! We have a selection of homes still available to purchase at Temple Gate. Click here to find out more.